Are you ready to care for someone with Multiple Sclerosis? 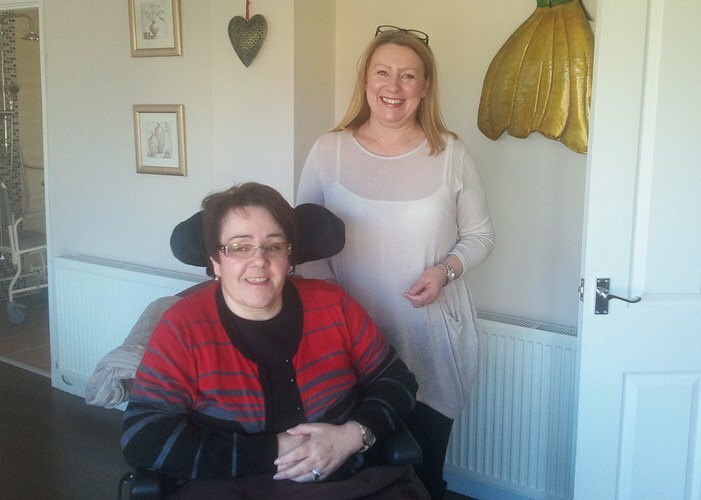 Sue Rushby knows all about living with MS and the challenges that each day brings. However many carers, even family members, do not fully appreciate the limitations this debilitating disease places on the individual and how there is no such thing as a 'normal' day with someone who battles with the illness. Sue is a client of Caremark (Redcar & Cleveland), a Guisborough based care provider who deliver care and support to people in their own homes enabling them to live more independent lives. Jan explained: "Sue was keen to share her story with us and principally our care workers with a view to helping them have a clearer understanding of the condition. She felt this would ultimately benefit all our care staff and the way care was delivered to others with MS.
"Sue's story goes back a few years when she first started to experience the very first symptoms of her illness, one being continence problems which upset her greatly. Shortly after that Sue fell and broke her ankle and it was during a protracted and difficult convalescence with this that she noticed her leg was dragging. Other worrying symptoms also started to appear and it took a while for her diagnosis of MS to be finally confirmed. Having confirmation that she really did have MS was daunting as Sue had no way of knowing how quickly her condition would progress. Sue picks up the story: "Unfortunately my illness progressed quickly and I was soon dependent on care and specialist equipment including a personalized electric wheelchair. The rapid change in my condition meant increasing difficulty with fatigue, movement and tremors which in itself brought their own problems." "In the early days following my diagnosis I decided to visit other people who had also been newly diagnosed with MS so that we could share our thoughts and I could offer some reassurance," she added. "The illness affects everyone differently and can lead to feelings of frustration and depression. Inevitably their spouse's/partners or carers can also feel overwhelmed and anxious." Jan continued: "After a couple of meetings with Sue I prepared a presentation which explained the illness and Sue agreed to be on hand to answer any questions from our staff." Jan booked a conference room at a local business park and a date was fixed for the presentation to the Caremark (Redcar & Cleveland) care team. "Sue was very open and honest with our group and was able to clearly explain the many complications that the condition creates," said Jan. "She described having two lives: one before MS and another with MS, which is something not many of us had stopped to think about." The presentation prompted many questions including very personal questions which Sue answered openly and honestly and with a great deal of humour. She explained how important it was for her to have the right carers. Sue reflected: "I still am a little uncomfortable having others complete my personal care; having trust and understanding with your carers is crucial and promotes stability which is a vital part of delivering good quality care." The session was a great success and everyone came away with a greater appreciation and understanding of what it is like to live with MS and how building an honest and trusting relationship between carer and client is so important when caring for someone with MS. Due to the success of this first session, another session is arranged for the end of April which will form part of Caremark (Redcar & Cleveland)'s in-house training. "We really appreciated having this opportunity and are very grateful to Sue for sharing her story with our carers. Going forward I feel this will have a really positive impact on the way we care for clients with MS and will only enhance the high level of care we already deliver." Jan said. Sue regularly attends her local MS society and makes use of the different facilities available at the centre, which serves the Tees Valley, North Yorkshire, County Durham, Tyne & Wear and into Northumbria. The centre was opened in 1985 and provides a range of essential therapies aimed at relieving and limiting the problems of MS. Currently these therapies are high dosage oxygen treatment, physiotherapy, yoga, therapeutic massage, reflexology, aromatherapy and counselling. They also provide support and therapy to people with other problems and neurological disorders. Jan concluded: "The centre is self-funded and raises income through donations and fundraising and Caremark staff will be organizing a sponsored walk in May at a local beauty spot to raise funds for them." To find out more about MS, visit Middlesbrough MS Society.